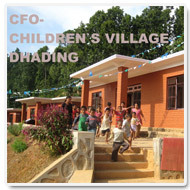 Hello, we are Uma and Kumari, the little kids at CFO-Children`s Village. It is cold this winter and we have to wear whatever keeps us warm: Woolen sweaters, scarves and the lovely knitted caps which cover the heads. Although it is fun, we look forward to the spring and to less hustle with clothing !